Frogs can be found on every continent, with the exception of Antarctica. Being cold-blooded amphibians, most frog species inhabit warm climates. However, several species of frogs have adapted to survive in freezing weather by hibernating. There are more than 4,700 frog species found throughout the world. The majority of species are found in moist tropical climates. Frogs fall into one of three categories depending on the habitat they are typically found in: terrestrial, arboreal or aquatic. Many frog species live in temperate climates that have winters, and hibernation during the cold months is key to their survival. Only six species of frog are known to survive freezing temperatures and belong to the families Hylidae and Ranidae. The wood frog ( Lithobates sylvatica ) is one species of terrestrial frog that has adapted to survive cold winters. This species is found as far south as Georgia and northward into Canada and Alaska. It is the only species of frog found in the Arctic Circle. During the winter, up to 45 percent of the frog's body actually freezes. Breathing and heartbeat stop. The frog spends a few months in this state before thawing out in the spring. The rarely seen spring peeper (Pseudacris crucifer) is another species of frog with the unique ability to survive freezing during hibernation. This frog is so named for his loud, distinctive call that he emits during the start of spring. The spring peeper has a range as far south as the Gulf Coast and as far north as the Hudson Bay. The forest dwelling frog can climb trees but spends most of his time on the ground. The western chorus frog ( Pseudacris triseriata ) inhabits a range that extends from southern Quebec down to Oklahoma. 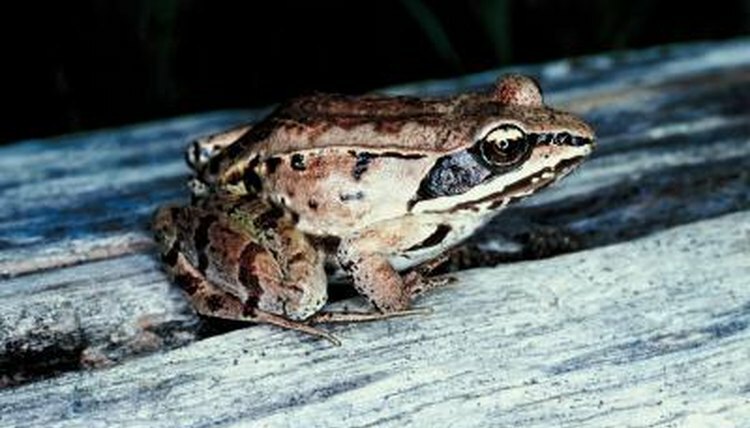 The primary habitats of this species are marshes and meadows, but the frog can occasionally be found in agricultural fields and forested areas. Like his relative the spring peeper, the chorus frog is known for his distinctive call that sounds similar to that of running your finger along a fine-toothed comb. Not all specimens are subject to freezing winters, but those that are survive. Two known species of gray tree frog are able to survive freezing. The common gray treefrog (Hyla versicolor) has twice the number of chromosomes as the Cope's gray tree frog (Hyla chrysoscelis), but otherwise these two species are identical in appearance. The two species also have different-sounding calls. Both species survive freezing temperatures in the same manner as other frogs, which is by possessing a high volume of glycerol in their blood. The European common frog (Rana temporaria) is another adaptable species capable of surviving harsh winters and the only known species outside of North America known to do so. While European frogs can be found throughout the continent, those living in colder climates live for up to 12 years while other members of the species that reside in more temperate regions live up to just five years. Those living in colder regions also grow bigger. Some pairs of cold weather European frogs even hibernate in mating position so eggs are fertilized as soon as warm weather arrives. Live Science: Can Frogs Survive Being Frozen?